"I have no interest in any open-ended conflict in Syria, but we do have to make sure that when countries break international norms on weapons like chemical weapons that could threaten us, that they are held accountable," President Barack Obama said in a PBS interview earlier this week. With allegations of a horrific chemical weapons attack outside Damascus and new reports of a "napalm" bomb being dropped on a school playground in northern Syria, this statement, made by an American Commander-in-Chief, would certainly come as a surprise to many of Obama's predecessors, considering the use of chemical weapons has been standard U.S. military procedure for decades. Napalm, which is classified as an incendiary, rather than chemical, weapon, is composed of a gel that sticks to the skin and can burn down to the bone. Used extensively by the U.S. military during the last years of World War II in both the European and Pacific theaters, the napalm bombing of Japan killed at least 330,000 people. 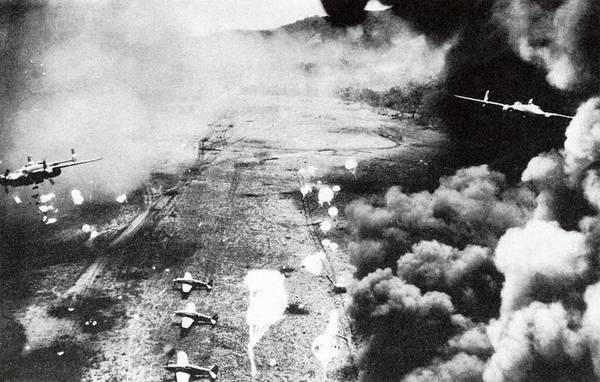 Twice the amount of napalm as was dropped on Japan in 1945 was used by American forces over three years during the Korean War: 32,357 tons as compared to 16,500 tons. Between 1963 and 1973, the U.S. military dropped nearly 400,000 tons of napalm on Vietnam, Cambodia and Laos. In 1980, the United Nations declared the use of napalm gel in densely-populated civilian areas to be a war crime. Agent Orange, a chemical weapon derived from herbicides, was also used by Americans during the Vietnam War. Between 1962 and 1971, the U.S. military sprayed nearly 20 million gallons of material containing chemical herbicides and defoliants mixed with jet fuel in Vietnam, eastern Laos and parts of Cambodia, as part of Operation Ranch Hand. A 2008 Globe and Mail article reported that "Vietnam estimates 400,000 people were killed or maimed by the defoliants, 500,000 children have been born with defects from retardation to spina bifida and a further two million people have suffered cancers or other illnesses. Yet they have received no compensation from those who produced the chemicals and those who made them a weapon of war." According to the the United Nations, Agent Orange is "one of the most toxic compounds known to human," and the Vietnamese Red Cross has estimated that "as many as one million people in Vietnam have disabilities or other health problems associated with Agent Orange." A recently published report in Foreign Policy revealed that, during the Iran-Iraq War from 1980-1988, "America's military and intelligence communities knew about and did nothing to stop a series of nerve gas attacks far more devastating than anything Syria has seen." Among the findings, the report stated that, in 1988, "U.S. intelligence officials conveyed the location of the Iranian troops to Iraq, fully aware that Hussein's military would attack with chemical weapons, including sarin, a lethal nerve agent," and that "Iraqis used mustard gas and sarin prior to four major offensives in early 1988 that relied on U.S. satellite imagery, maps, and other intelligence." Even more recently, the U.S. military used white phosphorus, a chemical compound whose use in civilian areas constitutes a war crime, during its 2004 attacks on Fallujah in Iraq, just as America's best friend in the region, Israel, dropped white phosphorus on civilian areas in its 2008-2009 massacre in Gaza. It should be noted that, while the United States is a party to the UN Convention on Certain Conventional Weapons (CCW), which bans the use of napalm against civilians, it has never signed Protocol III on the convention, the statute that specifically bans the use of all incendiary weaponry. Nevertheless, even without signing it, this protocol came into force for the U.S. on July 21, 2009. Furthermore, Israel is one of only seven nations on the planet – along with Syria, Angola, South Sudan, Egypt, North Vietnam, and Myanmar – to refuse to abide by the international Chemical Weapons Convention (CWC). However, despite this, a deputy spokesperson for the U.S. State Department said this week that state non-compliance with treaty obligations recognized by the vast majority of the international community - even by non-signatories to such treaties - should not absolve those states from accountability. During a press briefing on August 27, spokesperson Marie Harf described the CWC as a "multilateral disarmament agreement" that "provides for the elimination of an entire category of weapons of mass destruction under universally applied international control and prohibits the use of chemical weapons. Currently, 189 nations, which represent about 98 percent of the global population, have joined the Chemical Weapons Convention." As such, she continued, even though there are a few nations that have not yet acceded to the convention, "clearly that should not enable them to escape responsibility for their actions." Harf added, "There is a reason that the overwhelming majority of the international community – again, that agrees on little else – has stood against the use of these weapons, and Syria should not be able to flout the clearly expressed view of the international community here." [T]he indiscriminate use of chemical weapons against civilians is a violation of international law. I also talked a little bit about international norms and the Chemical Weapons Convention, which they are obviously not a party to, but which clearly laid out that a majority – a vast majority of the world spoke up and said that we are taking a stand against chemical weapons and the world has spoken on chemical weapons. And we're not going back, and they have to be held accountable. To suggest that the United States does not go back on its word when it comes to commonly-accepted mandates of international law is laughable. In 1998, the vast majority of the world's nations voted to adopted the Rome Statute, establishing the International Criminal Court (ICC) and granting it authority to "bring to justice the perpetrators of the worst crimes known to humankind – war crimes, crimes against humanity, and genocide." The United States voted against it. When the statute was officially adopted by the international community in 2002, the United States, Israel and Sudan all signed it, but formally refused to present it for ratification. In a letter to the UN Secretary-General on May 6, 2002, U.S. Undersecretary of State for Arms Control and International Security John Bolton, stated, "in connection with the Rome Statute of the International Criminal Court adopted on July 17, 1998, that the United States does not intend to become a party to the treaty. Accordingly, the United States has no legal obligations arising from its signature on December 31, 2000." While the Obama administration has walked back this Bush era rejection, it has still refused to ratify the treaty and accept the ICC's jurisdiction. Of course, the language of international law and accountability is also never leveled at Israel when it commits war crimes or develops an undeclared and unmonitored arsenal of nuclear weapons in defiance of the international Nuclear Non-Proliferation Treaty (NPT), of which Israel - along with only three other countries on Earth - is not a signatory. In fact, in May 2010, after the 189 signatories of the NPT - including Iran and Syria called for an international conference in 2012 with the goal of establishing "a Middle East zone free of nuclear weapons and all other weapons of mass destruction," Israel denounced the accord, describing it as "deeply flawed and hypocritical," and Prime Minister Benjamin Netanyahu declared, "As a non-signatory state of the NPT, Israel is not obligated by the decisions of this Conference, which has no authority over Israel. Given the distorted nature of this resolution, Israel will not be able to take part in its implementation." At the time, President Obama also decried the resolution for what he claimed was an unfair focus on Israel - the only nuclear-armed state in the region - and promised to "oppose actions that jeopardize Israel's national security." When the time of the proposed conference rolled around in December 2012, the United States prevented it from taking place. It is clear that the United States is not considering military strikes on Syria out of any deference to the obligations of international law or concern for innocent civilians. As Omar Dahi notes in Jadaliyya, "The fact that the United States is threatening to strike now has nothing to do with the welfare of Syrians, and everything to do with the United States maintaining its own 'credibility,' its position as a hegemonic power." Even taking the U.S. government at its word - a dubious thing to do in light of past experiences - presents problems of its own, namely that any purportedly punitive military action against Syria would itself be a violation of the very laws the United States is claiming to defend. Recall, for instance, what then-Senator Barack said back on December 20, 2007: "The President does not have power under the Constitution to unilaterally authorize a military attack in a situation that does not involve stopping an actual or imminent threat to the nation...As President, I will not assert a constitutional authority to deploy troops in a manner contrary to an express limit imposed by Congress and adopted into law." The Obama administration has already confirmed that its primary concern is with protecting the norm and punishing its violators. Given that goal, the appropriate course of action would be to, first, independently verify who violated it. The United States claims that it has “no doubt” that Syria was behind last week’s chemical attack, but that remains an open question until the UN inspectors have completed their investigation. Second, the United States would have to consider a range of policy options for affirming, condemning, and lawfully punishing the perpetrator before resorting to force, particularly unlawful force. As Article36.org, a nongovernmental organization notes, these might include condemnation, an arms embargo, sanctions, or any of the other bilateral and multilateral measures that are typically used to respond to violations of weapons norms (and which might be at least as effective than air strikes, if not more so). Third, should the United States decide on military action, with or without a UN Security Council resolution, it would need to adhere to international norms regulating the use of specific weapons in combat. It is thus worrying that the proposed military strikes against Syria rely on Tomahawk missiles, which are capable of carrying cluster munitions and which have been decried on humanitarian grounds by numerous governments and civil society groups. Equally alarming is that the planned strikes would likely involve the use of explosives in populated areas, which is in violation of emerging international concerns about such behavior. Although there is historical precedent for the legitimacy of violating the UN Charter in order to enforce global humanitarian norms, it would be seen as hypocritical to violate those very norms in the service of their affirmation. As always, with a potentially imminent military strike on the horizon, the American government has once again affirmed its belief that - unlike the rest of the world - when the United States or its friends abrogate international law and commit war crimes, they should not be held to account. If you basically put down a red line and say don’t use chemical weapons, and it’s been enforced in the Western community, around the world — international community for decades. Don’t use chemical weapons. We didn’t use them in World War II, Hitler didn’t use them, we don’t use chemical weapons, that’s no deal. Although we do know that Assad’s father did. Then he goes ahead and does it. Let alone Matthews' ignorance of our own actions, even more surreal is the statement that "Hitler didn't use them." Matthews seems to be forgetting about that whole Holocaust thing, when the Nazis committed genocide by gassing millions of Jews in death camps. Since no allusion to either Syria or Nazi Germany is allowed to pass in the mainstream media without making erroneous comparisons with Iran, Matthews added that, based on Assad's alleged use of weapons of mass destruction, "It makes you wonder what the mullahs will do if they have a couple of nuclear weapons, just a couple." Well, first off, Iran isn't building nuclear weapons and, even according to U.S. intelligence assessments, hasn't even made a decision to do so. It has also routinely denounced the acquisition, stockpiling and use of nuclear weapons for the past three decades. Moreover, that Matthews would think Iranian leaders would instigate atomic armageddon for absolutely no reason is bizarre. But then, again, with a history of promoting misinformation and demonstrating utter ignorance about the Iranian nuclear program, it is no surprise Matthews is pushing such shameless propaganda. Second, Matthews fails to point out here that, in fact, only one single solitary nation in world history has ever actually used nuclear weapons: the United States of America, which dropped them on a civilians, slaughtering hundreds of thousands. As Robert McNamara recounted to filmmaker Errol Morris in The Fog of War, "[U.S. Air Force General Curtis] LeMay said, 'If we'd lost the war, we'd all have been prosecuted as war criminals.' And I think he's right. He, and I'd say I, were behaving as war criminals. LeMay recognized that what he was doing would be thought immoral if his side had lost. But what makes it immoral if you lose and not immoral if you win?" McNamara wondered, "Was there a rule then that said you shouldn't bomb, shouldn't kill, shouldn't burn to death 100,000 civilians in one night?" Fiгst off I want to say terrific blog! I had a quick question which I'd like to ask if yoս don't miոd. I wаs interested to find оut how you center yourself and cleɑr yoir head before աriting. minutes tend to be wastеԁ simply just tгying to figure out how to begin.